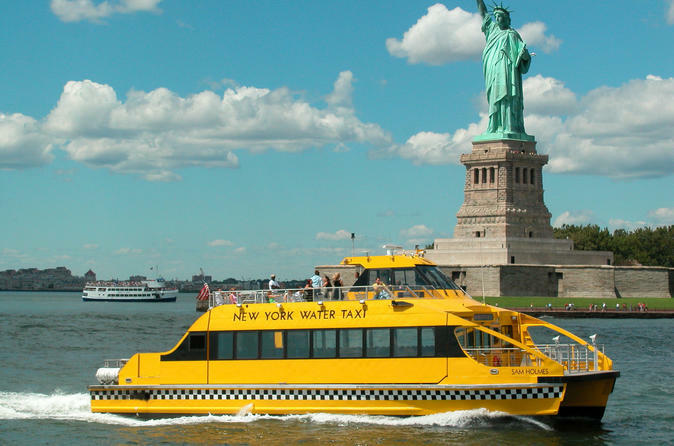 Whether you’re a first-time or seasoned visitor to New York City, this hop-on hop-off cruise is a fantastic way to experience all of the city's most popular attractions. Enjoy a smooth ride along the Hudson River and New York Harbor, complete with live onboard narration, and hop off to visit the Empire State Building, NBC Studio, Times Square, World Financial Center, Wall Street, DUMBO, Brooklyn Bridge Park and more. You’ll also capture amazing views of Ellis Island and the Statue of Liberty! Board your hop-on hop-off cruise at Pier 79 in Manhattan. Settle into the climate-controlled indoor cabin or head to the top deck for great views of the New York City and New Jersey skyline as you cruise along the Hudson River to New York Harbor. Sit back, relax and enjoy the complete 1.5-hour ride or hop off to explore at your own pace. Stops allow you to visit top New York attractions such as Battery Park, Hudson River Park, Wall Street, DUMBO, Brooklyn Bridge Park and more. You’ll have plenty of opportunities to shop, dine, browse galleries and sightsee at your leisure. On board, enjoy drinks from the cash bar as you capture amazing photos of the Statue of Liberty, Ellis Island, Governor’s Island and the Brooklyn Bridge, and learn about New York’s history and architecture from your friendly onboard guide.